The society of the Masonic Rosicrucians presents us with a series of numbered degrees (nine in all) with associated ceremonies to confer these degrees. Unlike the Scottish Rite however, the first degree of the Masonic Rosicrucians is not the first degree, or Entered Apprentice degree, of the Blue lodge. Instead, the Masonic Rosicrucians commences who1ly a new with a sequence of degrees of its own. This circumstance stems from the fact that the origin of the Masonic Rosicrucians lay in previously existing societies which were not masonic, but wholly rosicrucian in character. And given the undoubted connection between rosicrucianism and the qabala, we have ample warrent for interpreting the stations of the officers in the first, or zelator degree, of the masonic rosicrucians, in qabalistic terms. 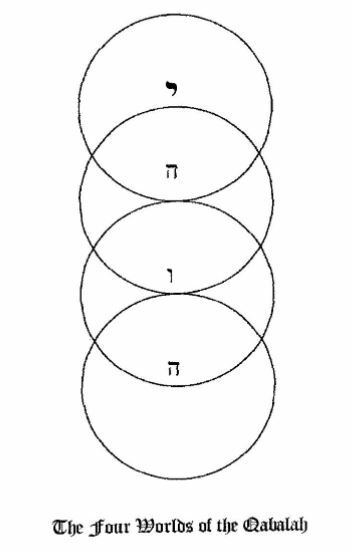 Beginning from the time of the Rennaissance onward, the Qabalah was increasingly studied by non-Jewish thinkers and writers, such as Pico de Ylirandola, Athanasius Kircher and many others. There arose schools of ”Christian Qabalah” and “Hermetic Qabalah”, which constituted qabalistic interpretations from either a Christian or Hermetic point of view. The Christian Qabalah served one or the other of two purposes. It was formulated as an attempt to convert Jews to Christianity by presenting Christian ideas in qabalistic garb; or from the purely Christian point of view, it sought to penetrate to the essence of the thought of Christ through the oral tradition in Israel. The Hermetic Qabalah was syncretic in character, and it sought to gain insight by amplifying an underlying unity of the Hermetic and Qabalistic writings. Prominent in the Christian Qabalah is the special qabalistic spelling of Jesus, which is therein spelt as, יהשוה or Yeheshua, in which the fire of the holy spirit (represented by the Hebrew letter Shin) is placed in the midst of the holy name of God, or Tetragrammaton, יהוה (rendered as Jehovah in the King James version of the Bible). This particular spelling of Jesus is an invention of the post-Rennaisance Christian qabalists (Athanasius Kircher) and it is not the authentic ancient spelling of Jesus in Hebrew; it was invented to place Christian ideas in qabalistic garb. This particular spelling of Jesus assumed et prominence in later gentile esoteric associations, such as the Martinist Order and the Hermetic Order of the Golden Du,·n, wherei n it was treated as a sacred formula of great mystery. The jewel of the 18th degree of the Ancient and Accepted Rite, as it is presently worked in England, contains this particular spelling of the name of Jesus. The Hermetic and Christian Qabalah influenced certain esoteric associatons and groups, which were often connected with Freemasonry. For example, in the eighteenth century, Martinez Pasqually formulated the society of elus cohens, or “elect priests”, as a masonic order, but in which the initiates were taught to contact angelic levels through ceremonies based on the qabalah, as well as freemasonry. (The elus cohens was revived during World War II by Robert Ambelain, a member of the french resistance. It is now ruled in North America by a Chief of that Order who lives near Toronto, and who in the past has held high office in the regular Masonic Knights Templar.) Our society of masonic rosicrucians is historically the second of two distinct masonic rosicrucian movements. The first, or earlier movement was the “Gold und Rosenkreuzer”, which was influential during the late seventeen hundreds in the German speaking parts of Europe. Examination of the high grade documents of the “Gold und Rosenkreuzer” (i.e., the magister and magus degrees of that Order) clearly reveals that Qabalistic elements played a prominent role in their teachings. Many of the historical arcane movements of European esoterica are Christian in membership, but amplify the teachings of the Christian Qabalah, often times in both its theoretical and practical aspects. Our society of masonic rosicrucians is in this tradition of a Christian initiatic society, incorporating elements of the qabalah in its ceremonies. (The masonic rosicrucians are presently in three branches: the SRICF in the U.S., the SRIA in England, Europe, and Canada, and the SRIS in Scotland. The present High Council of SRIA is explicitly Christian and Rosicrucian in character, and it is allied with other non-masonic Rosicrucian societies, such as the Fellowship of the Rosy Cross, founded by Arthur Edward Waite (Private communication from R.A. Gilbert archivist of SRIA); in the U.S., the SRICF functions as an honorary and literary masonic society closely associated with the Grand Lodges and York Rite, and it currently has no associations with other rosicrucian societies.) The qabalistic symbolism of the Zelator degree of the masonic rosicrucians is explained in the pamphlet “Clavicula Rosicruciana, No.V: Lecture on the Religious Symbolism of the Four Pillars”, which is issued to members of the SRIA. My analysis of the qabalistic symbolism is based in part on the Clavicula Rosicruciana lecture. For the purpose of exposition, I blatently plagerize from this pamphlet (followingan old and venerable tradition, of course). In the first part of the Zelator Ceremony there are Four Colored Pillars in the Rosicrucian Temple, arranged from the West to the East representing the Four Elements, Earth, Air, Water and Fire, and they are colored respectively black, yellow, blue and red. These are respectively at the stations of the First, Second, Third, and Fourth Ancients. Commencing at the West, where the Aspirant is first placed to undergo the trials prescribed by our Ritual we find the Black Pillar bearing a vessel containing Earth. Inscribed on the side of the Pillar we have the astrological symbol of Taurus the Bull, in white, which is the complementary color to black; it is the principal member of the Earthly astrological trigon of Taurus, Virgo, Capricornus; the alchemical symbol of earth is a reversed triangle with a cross-bar. This Pillar represents the passive element earth. Proceeding eastward, we have the yellow pillar, representative of the active element air, with the fan. Inscribed upon it in violet is the astrological symbol of aquarius; the most potent of the aerial trigon of gerneni, libra, aquarius; the alchemical symbol of air is the upright triangle with a cross-bar. Then we have next the blue pillar, symbol of the passive element water, with a vessel of water upon it and the astrological symbol of scorpio in orange; it is the representative of the watery trigon of cancer, scorpio, pisces; the alchemical symbol of water is the triangle pointing downwards. Then lastly we have the Red Pillar denoting the Active Element Fire, and on it in Green, its complementary color, the astrological symbol of Leo the Lion, representative of the fiery trigon of Aries, Leo, Sagittarius; the alchemical symbol of fire is an upright triangle. 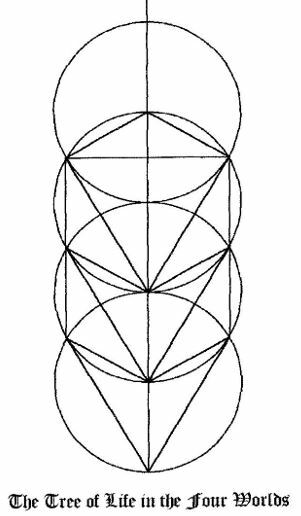 In the symbolism of the Qabalah, the station of each Ancient is at the center of a circle representingone of the four Qabalistic worlds; but the four Ancients taken together represent the cosmological glyph of the Four Worlds of the Qabalah. Hence the Rosicrucian Temple may be seen to represent the Universe (or Olahm) in its entirety. And if we encounter symbolic tests as Zelator Rosicrucians, it is because we are conceived as citizens of a Universe created by God, and in which He is continuously testing every part of His creation. The Orient of this Qabalistic (or Rosicrucian) Temple is Kether, God, or Crown of Creation, and the West is Malkuth, the Kingdom of manifest existence, for the external life of Man. The Center of the Temple is in Tiphareth, symbolizing the Son of God, as representing the Divine Reconciler between God (the East) and Man (the West). Thus we have in the First Part the Old Testament represented by Jehovah as the Tetragrammaton, and the New Testament in the Second Part by Jesus as I.N.R. I.; the Father and the fodiatorial Son, the Macroprosopus and the Microposopus of the Hebrew Qabalah. Thus we can see the symbology of the first point (from a Qabalistic point of view) representing the whole Universe as the Temple and the formulae of Divine Creation, but that the symbology of the second point represents the Cross of the Redeemer, which restores the unregenerate man to the Kingdom of Light. The Rituals of SRICF can be interpreted in the light of qabalistic symbolism; this circumstance is connected with the historical relationship of SRICF with an intellectual movement in Europe in which the symbolism of the Qabalah played a significant role.